A Clutch purse for Evening Wear. Suitable for Genesis, G2F, Dawn and any Generation Figure. For use in Daz Studio 4.6. 8 Textures included. Parent to figures hands and size to fit. 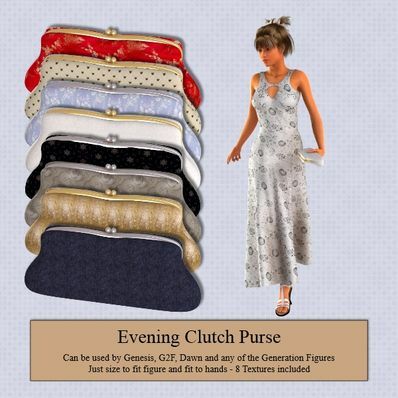 Thanks so much for these Clutch Purses. Can't wait to try our various leather textures and gold glitter etc. to them. Just wonderful! Thanks Wendy. Very cute & useful. Very useful. Great work.. Thanks, Will..